This year summer weather arrived to my home town of Portsmouth very late. Nevertheless, sun is out now and everyone seems to be more cheerful and smiling. July is my favourite month of the year and summer is my favourite season. It is a time of the year when I wear lighter make-up, fresh girly scents and my nails are more vibrant too. 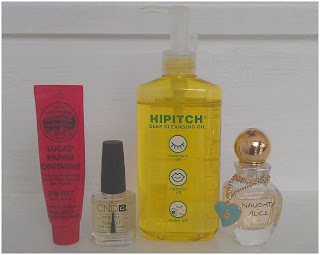 As July has just ended I thought I might share some of my favourite products of the past month. I absolutely love this product. My lovely sister-in law gave it to me to try out when I was in Australia this spring and I have used it ever since. It has a clear colour and the consistency reminds me of Vaseline and 24 Hour Cream by Elizabeth Arden. It is a fruit based product (papaya) with a lovely neutral scent. I have used it as a hand treatment, lip balm, to sooth sunburn and for insect bites. Lucas' Papaw Ointment is so versatile and practical to carry around in a bag. This is the award winning nail and cuticle conditioner. It does exactly what it says on the bottle. In a just few weeks of using this oil my brittle nails feel so much stronger. Smells wonderful and every evening when I use it (by massaging it into my cuticles) I get tempted to lick it hehehe. CND Solar oil is full of good stuff for your nails, such as sweet almond oil, jojoba oil and vitamin E.
To remove my make-up, especially heavy duty eyeliner or waterproof mascara I love using Hipitch Deep Cleansing Oil. The way I use it is so simple; just pump once into my hands, massage directly onto my face, emulsify with warm water and rinse. I definitely recommend this product, it works a treat for combination skin like mine. What are your current favourite products?